Subheadings: Chart No. 165: Winter Season 1931-1932 Chart No. 166: Spring Season, 1932 Chart No. 167: Summer Season, 1932 Chart No. 168: Autumn Season, 1932 Chart No. 169: Winter Season, 1932-1933 Including All the Aspects Affecting Temperature. BECAUSE, as already indicated, temperature is the most important influence both in air movements and in the precipitation of moisture, not only the temperature, but much about wind and moisture in their general effect on the season can be learned from the Temperature Chart. But the days during the season when such wind and moisture, as shown by the season Temperature Chart, will be present, are to be determined from the Air Movement Chart and the Moisture Chart, respectively. In its timing of weather conditions, however, the Temperature Chart is to be used exclusively to indicate changes in temperature. Temperature Charts are erected for the place where the weather is to be ascertained, at the exact moment the Sun enters Aries, enters Cancer, enters Libra, and enters Capricorn. The chart for the time the Sun enters Aries indicates the temperature, and its changes, until the Sun enters Cancer. The chart for the time the Sun enters Cancer indicates the temperature, and its changes, until the Sun enters Libra. The chart for the time the Sun enters Libra indicates the temperature, and its changes, until the Sun enters Capricorn. The chart erected for the time the Sun enters Capricorn indicates the temperature, and its changes, until the Sun once more enters Aries. Thus do the four charts cover the temperature for the year. And it is the aspects made by the planets as they move through the zodiac and change declination, as shown by their positions on the given calendar date in the ephemeris, to the degree on the Ascendant of these Temperature Charts that indicate the time and amount of temperature changes. In the various ephemerides issued annually is a table which shows the “Time when the Sun and Moon enter the Zodiacal Signs.” If the time there given is m, it means before noon; it is given as af, it means afternoon. The time thus designated is Greenwich Mean Time. Therefore, from this time as given in the ephemeris, the Local Mean Time of the same moment must be calculated for the place where the weather chart is to be erected. 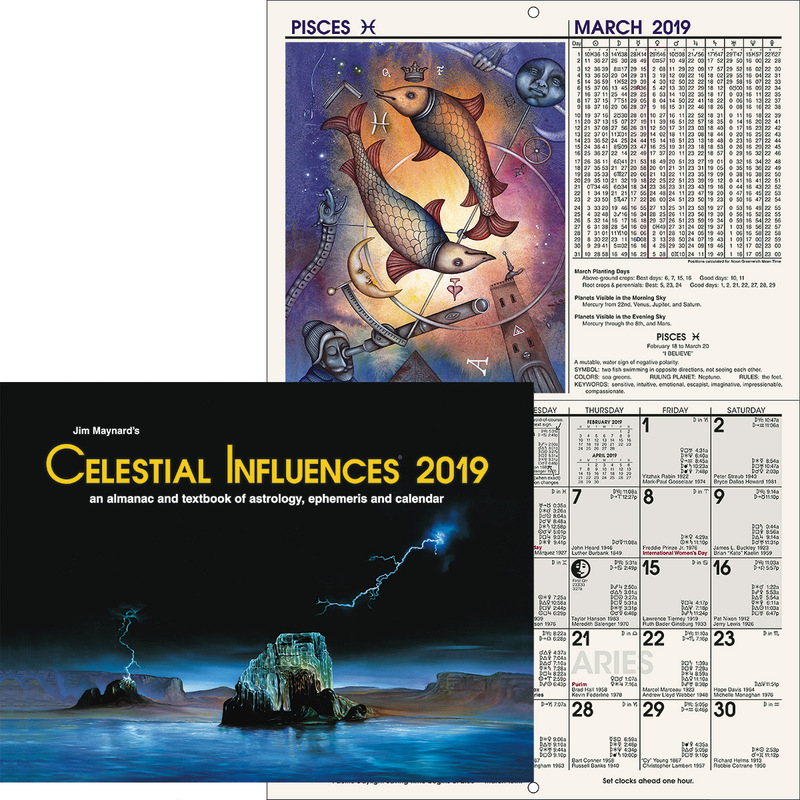 Thus the ephemeris shows that in 1929 the Sun entered Aries on March 20, at 2:35 A.M. Now if the Temperature Chart were to be sought for this date in Chicago, the corresponding Local Mean Time at Chicago must be found. Chicago is 87W39. This is equivalent to 5h 50m 36s in time. Subtracting 5h 50m 36s from 2h 35 A.M. on March 20, gives the Local Mean Time at Chicago for which the chart should be erected as March 19, 1929, 8h 44m 24s P.M. If the chart were to be erected for New York weather, because New York is 74 degrees West Longitude, we must subtract 4h 56m from 2:35 A.M. This gives the proper time for erecting the chart at New York as March 19, 1929, 9h 39m P.M. LMT. In 1931 the ephemeris shows that the Sun entered the sign Cancer on June 22, 9:28 A.M. As this is Greenwich Mean Time, if we wished to erect a Temperature Chart for Washington, D. C., we would subtract 5h 8m from this time, because Washington is 77 degrees West Longitude. This gives us the Local Mean Time for erecting the chart at Washington as June 22, 1931, 4:20 A.M. The ephemeris for 1933 shows that the Sun entered Libra, giving the chart for the autumn temperature, September 22, at 12:01 P.M. Now if this Temperature Chart were desired for Denver, Colorado, as Denver has West Longitude 104:59, we subtract 6h 59m 56s from 12h 01, which gives the Local Mean Time at Denver as September 22, 1933, at 5h 1m 4s A.M. The ephemeris for 1933 shows that the Sun entered Capricorn, giving the chart for the winter temperature, December 22, at 6:58 A.M. If this Temperature Chart were desired for Los Angeles, as Los Angeles is 118:15 West Longitude, we subtract 7h 53m from 6h 58m, which gives the Local Mean Time at Los Angeles as December 21, 11:05 P.M.
As the time given in the ephemeris for each weather chart is Greenwich Mean Time, in each instance the positions of the planets must be calculated for this EGMT. But in each case the degrees of signs on the house cusps must be calculated, as illustrated, from the EQUIVALENT LOCAL MEAN TIME. 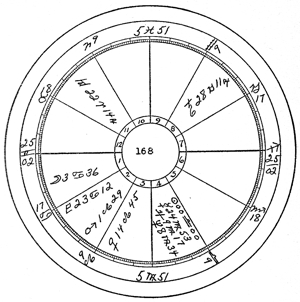 In judging all weather charts the general rule should be followed of considering one-half of the total influences as indicated by the fourth house, one-fourth of the total influences as indicated by the first house, one-eighth of the total influences as indicated by the planet for which the chart is erected, and one-eighth of the total influences as indicated by planets in angles. But in addition to this, the weather forecaster must make himself familiar with the normal weather in the particular area for the season covered by the weather chart. This can be done by consulting reports made by the Weather Bureau. At the time the weather chart studies presented in this course on weather predicting were made, the U. S. Department of Agriculture, Weather Bureau, printed a Weather Map daily, except Sundays and holidays, for each section of the country, and these were given careful study over many years. This weather map, among other things, gives the precipitation for the last 24 hours, wind velocity at a certain hour in the morning (this feature was discontinued July 7, 1933), the temperature at 8:00 a.m., 75th meridian time, and the amount of temperature change in the last 24 hours; for some 92 different weather stations throughout the United States. Also published by the Weather Bureau of each section was a monthly publication called Climatological Data which, among other things, indicated the monthly normal temperature and precipitation and the departure from normal for the month, of each year since 1897. From it could be determined for the section covered how much more than normal, or how much less than normal, was the temperature and precipitation of moisture, for the given month. The date, and amount, of the maximum wind velocity for the important stations in the section were also given. With the necessity for great precision in close range weather forecasts due to the dependence of aviation on probable weather, and the daily weather forecasts given over the radio, changes are taking place in the manner the Weather Bureau handles weather data. Therefore, those who take up the study of Weather Predicting should get in touch with the Weather Station in their area and ascertain the nature of the records available for study. After 16 years in which students in many areas have experimented with the method of weather forecasting here presented, I have not found it necessary to make any change in the system or the data. 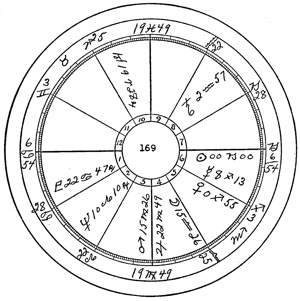 However, in 1933, in natal astrology, in horary astrology, in mundane astrology, and in stellar diagnosis, as well as in weather predicting, it was customary to ignore parallel aspects made to the Ascendant. Since that time statistical research has shown that in all these charts parallel aspects to the Ascendant have significance. Parallel aspects to the Ascendant commonly last over quite a period of time, and influence the weather over this period, which in the case of the slower moving planets may last for weeks, and even for months. Therefore, while in these lessons parallel aspects to the Ascendant are seldom mentioned, in weather predicting as now better understood they should be given due consideration. For the purpose of indicating how the Temperature Charts should be used, I will refer to the Temperature Charts for Los Angeles which were part of the original weather predicting studies. But it should be understood that such Temperature Charts can be erected and quite as effectively used at any other place. In the use of the data furnished by the Weather Bureau over the periods covered in these lessons it should be understood that the change of temperature recorded is that computed for the preceding 24 hours, as read at a certain time each morning. Also, that a planet has an influence over the temperature during the time it is within the one effective degree of orb to the ° and ′ on the Ascendant. The Sun entered Capricorn December 22, 1931, at 11:37 A.M. LMT., Los Angeles. Chart No. 165, erected for this time, is given in Serial Lesson 190 (Course XV, Chapter 1). Gemini, a cold sign, is on the cusp of the fourth, and Mercury, its ruler is in the warm sign Sagittarius. This accounts for one-half of the influence of the chart. Cold Uranus is in the first house. Pisces, on the cusp of the first, is cool, and Neptune, its ruler, is in cold Virgo. This accounts for one-fourth of the influence of the chart. Saturn, ruling the sign occupied by the Sun, is in cold Capricorn. This accounts for one-eighth of the influence of the chart. Sun and Mars in an angle are hot, but are offset by cold Mercury and cold Uranus also in angles. This accounts for one-eighth of the influence of the chart. It will be noted that March 20 brings in a new Temperature Chart, and that the one now being considered shows indications only up to that date. Climatological Data for March reads: “Relatively cool weather prevailed during the first week and from the 20th to the 22nd, while during the remainder of the month daily mean temperatures were well above normal.” The temperature for the month was 1.7 degrees warmer than normal. But now let us observe just when the more marked fluctuations in temperature occurred covered by this Chart No. 165. The best way to learn what to expect, and when to expect it, seems to be to observe the exact day on which each aspect from any planet forms to the ° and ′ on the Ascendant. In this case we must consider, by consulting the ephemeris, when each aspect to 21 Pisces 23 occurs, making due allowance for the fact that the ephemeris gives the positions eight hours later than the Standard Time at Los Angeles. Conjunctions, oppositions, squares and trines, of course, are most important; but even the weaker aspects may also be noted. The daily Weather Map shows just what actually occurred on the day of the aspect in regard to temperature change unless the day was Sunday or a holiday. In these instances, the best we can do is to observe what took place on the adjacent days. Sunday, December 27, 1931, Mercury is 21 Sagittarius, and thus square the Ascendant. Mercury tends to coolness, and Saturday, December 26, the temperature dropped five degrees. December 31, Venus was 6 Aquarius, and thus semisquare Asc. Venus has a moderating influence, and the temperature went up one degree. The influence of Jupiter, because it remains within the one effective degree of orb so long, lasts some time. January 4 Jupiter lacked only a few minutes of inconjunct Asc., and on that date the temperature went up one degree, and then four degrees more on the 5th. This upward trend, however, given by Jupiter, was checked for a day or two by cold Mercury turning direct and making the square of the Asc. on the 5th. Jan. 12, the Sun made the sextile to the Asc., and Venus made the semisextile to the Asc. Too much in the way of heat should not be expected from planets in cold signs, and Venus was in Aquarius and the Sun in Capricorn. Jan. 11, the temperature went up eight degrees, fell three degrees on the 12th, and fell 14 degrees more on the 13th after both planets moved beyond aspect to the Asc. Jan. 26, Mars made the semisquare to the Asc., and on Jan. 27 the Sun made the semisquare to the Asc. Under the heating influence of these two planets the temperature went up four degrees on the 26th and another degree on the 27th. Jan. 30, Mercury came to the sextile of the Asc., lowering the temperature three degrees on the 29th, and raising it one degree on the 30th above what it was on the 29th. Feb. 5, Venus came to the conjunction of the Asc. Venus is a moderate influence, and on Feb. 4 the temperature went up eight degrees, another seven degrees on the 5th, and two more degrees on the 6th. The conjunction is a powerful aspect. Feb. 9, Mercury, a cooling influence, came semisquare Asc., resulting the following day in a temperature recording five degrees lower. Feb. 11, the Sun, a warm planet, but in the cold sign Aquarius, came semisquare Asc., resulting the following day in a temperature rise of only one degree. Feb. 14, Mars, the hot planet, came semisextile the Asc., from the cold sign Aquarius, resulting in a temperature rise of four degrees on the 13th, there being no record for the 14th, as it was Sunday. Feb. 18, Mercury made the semisextile to the Asc., showing a rise of five degrees on the 18th and a fall of four degrees on the 19th. March 1, Venus came semisextile the Asc. from Aries, with a temperature rise of one degree. March 5, Mercury came conjunction Asc. There was a fall of six degrees on the 4th, and a rise of two degrees from this position on the 5th and on Monday the 7th, the next recorded day, there was a lowering of three degrees the movement as a whole showing lowered temperature. March 12, the Sun came conjunction the Asc. Pisces is a cool sign, and the chart as a whole shows coolness. The general tendency of this conjunction was not to warm, as the Sun�s influence commonly is, but to lower. March 11 there was a rise of one degree, a fall of two degrees on the 12th, and on Monday, March 14, a further fall of nine degrees. This was undoubtedly due to cold Mercury being parallel the Asc. This fall in temperature, however, was checked on March 15 by the semisquare of Venus to the Asc. This covers the aspects of the planets to the Ascendant, and also the pronounced temperature changes, during the winter season. The lesser temperature changes are to be found from the aspects made by the Moon to the Ascendant. The Sun entered Aries March 20, 1932, at 12:01 P.M. LMT., Los Angeles. Chart No. 166, erected for this time, is given in Serial Lesson 190 (Course XV, Chapter 1). Virgo, a cold sign, is on the cusp of the fourth, and Mercury, its ruler, is in the hot sign Aries, but conjunction cold Uranus and square cool Pluto. This accounts for one-half of the influence of the chart. Cool Pluto is in the first, and cold Cancer on the Asc. The Moon, ruler of the Asc., is in the cold sign Virgo. This accounts for one-fourth of the influence of the chart. Mars, ruling the sign occupied by the Sun, is in cool Pisces trine cool Pluto. This accounts for one-eighth of the influence of the chart. Of the five planets in angles, only the Sun is warm, while Mercury, Uranus and Saturn are cold, and Pluto is cool. This accounts for one-eighth of the influence of the chart. We may conclude, therefore, that Mercury in Aries would give some warm periods, but that the general tendency would be toward cool weather. Climatological Data records that both April and May were cooler than normal, but that June was slightly above normal. The Asc. of the chart is 13 Cancer 38. Venus commonly betokens mildness of temperature, and on March 21 Venus came sextile the Asc. from Taurus. While the temperature on the 2lst was two degrees lower, yet before the aspect left its one degree orb it started up, and on the 22nd was eight degrees higher. The next aspect to the Asc. was on the 3rd of April which, as might have been expected from the Sun in the fiery sign Aries making the square to the Asc., started a rise in temperature that lasted several days. Venus on the same days was semisquare the Asc. The 3rd was Sunday, but the reading on the 2nd showed two degrees warmer, and on the 4th up another degree, and on the 5th still another degree higher. The Moon, which I here use in the absence of heavier aspects, in Taurus, made the sextile of the Asc. on the 8th, bringing a temperature rise on the 7th and 9th. Within 24 hours of the Moon�s conjunction with the Asc. the temperature fell on the 14th. Otherwise the temperature remained quite constant until the day of the next heavy aspect. Mars, itself, tends to heat; but at the same time Mars was square the Asc. on April 21, Mercury was moving slowly well within orb of square the Asc. There was a fall of nine degrees on the day mentioned, but the temperature started up again while Mars was still within orb of square Asc. May 4, the Sun came sextile the Asc., and slow-moving Jupiter made the perfect sextile with the Asc., starting a rise in temperature, commencing with two degrees up on the 5th, above what it registered on the 4th, and continuing upward for over a week. Until May 19 the temperature changes were solely under the aspects from the Moon, but on that date the Sun came semisquare the Asc. This registered both as a rise and fall, up three degrees on the 18th, down two degrees on the 19th, and up one degree on the 20th. Mercury, which commonly indicates a temperature drop, came sextile the Asc. on May 25, with temperature seven degrees lower. Then on May 28 Venus, which usually indicates milder weather, came conjunction the Asc., resulting in a rise of two degrees. May 30, Mars came sextile the Asc., marked by a dropping off of one degree on the 31st, but with a sharp rise of four degrees on June 1, while the aspect was still within the one effective degree of perfect. The semisquare of Mercury to the Asc. on the 2nd of June was offset by the warmth of the Sun semisextile Asc. on June 4. The two influences, one warm and the other cold, produced no change. Then on June 9 Mercury came semisextile the Asc., with its customary influence, a falling off of the temperature during the following day of three degrees. Venus had by this time turned retrograde, and by June 16th it had backed up to a conjunction with the Asc. with a rise of four degrees in temperature. As the final aspect of the season, other than those of the Moon, so far as temperature was concerned, on June 20 Mars came to the sextile of the Asc., and on that day the temperature showed a rise of four degrees. The Sun entered Cancer June 21, 1932, at 7:30 A.M. LMT., Los Angeles. Chart No. 167, erected for this time. Libra, a cool sign, is on the cusp of the fourth, and Venus, its ruler, is in cold Cancer conjunction cold Mercury. This accounts for one-half of the influence of the chart. Jupiter, a warm planet, is in the first. Hot Leo is on the cusp of the first, but its ruler, the Sun, is in cold Cancer. This accounts for one-fourth of the influence of the chart. The Moon, ruling the sign occupied by the Sun, is in cold Aquarius, conjunction cold Saturn. This accounts for one-eighth of the influence of the chart. Of the three planets in angles, Jupiter is warm, but Saturn is cold and the Moon is cool. This accounts for one-eighth of the influence of the chart. Thus the reading for the whole season indicates more than usual cool weather, with some nice warm Jupiter periods. Climatological Data records that July and August, as well as latter June, were well below normal temperature, but that September was well above, there being much warm, sunshiny weather that month. The Temperature Chart shows 3 Leo 32 on the Ascendant. The first aspect, other than from the Moon, to the Ascendant occurred June 22 when Saturn came opposition the Asc., lowering the temperature on the 21st three degrees, on the 22nd one degree, and on the 23rd one degree more. This downward trend, given by the slow moving Saturn, was checked on June 24 by the Sun coming semisextile to the Asc., giving an upward trend to the temperature of three degrees. This influence of Saturn continued for some time, but Mars, the hot planet, came sextile the Asc. on June 27. It took a day to overcome the persistent influence of Saturn, but between the 28th and 29th the temperature rose two degrees. July 4, Mercury came conjunction the Asc., but as this was a holiday there is no record, and the following day showed no change. The square of the Moon to the Asc. on July 12 brought a drop of four degrees, but otherwise the temperature remained quite steady until Mars came semisquare the Asc. on July 18, with a rise of three degrees. The conjunction of the Sun with the Asc. on July 26 brought a rise of only one degree in temperature; the parallel of Saturn to the Asc. throughout July tending to offset the influence of the Sun. August 5, Venus came semisextile the Asc., with a rise in temperature of only one degree. The weak aspect of Mars semisextile the Asc. from the cold sign Cancer on August 10 brought no recorded change. The Moon square the Asc. on August 14, which was Sunday, was followed by a drop of only one degree recorded the following day, the temperature running about the same until the Moon made the trine to the Asc. from Aries, a hot sign, on August 19, with a rise of five degrees on the 18th and one degree on the 19th. The next aspect, other than from the Moon, occurred August 26. It was Sun semisextile Asc., with a rise of three degrees. Aug. 28, Jupiter also came semisextile the Asc. This was Sunday, but the record shows a fluctuation of three degrees down on August 29, and two degrees up on August 30. Sunday, September 11, the Sun came semisquare the Asc. from cold Virgo, with a rise of two degrees recorded on Saturday the 10th. There is little heat in the sign Virgo, however, and by Monday, Sept. 12, the temperature was down four degrees; possibly due to the moderating influence of the planet Venus, which on that day came conjunction the Asc. The tendency of Venus when the weather is cold is to make it warmer, and when the weather is hot to make it cooler. The Sun entered Libra September 22, 1932, at 10:23 P.M. LMT., Los Angeles. Chart No. 168, erected for this time. Four planets are in the fourth house. Jupiter and the Sun are warm, Neptune is cool, and Mercury is cold. Virgo, the sign on the cusp of the fourth is cold. Mercury, ruler of the sign on the cusp of the fourth, is in the cold sign Virgo. This accounts for one-half of the influence of the chart. Moon in the first house is cool, and Gemini on the cusp of the first is cold. Mercury, the ruler of the sign on the Asc. is in cold Virgo. This accounts for one-fourth of the influence of the chart. Of the five planets in angles, Sun and Jupiter are warm, but Moon and Neptune are cool, and Mercury is cold. This accounts for one-eighth of the influence of the chart. Furthermore, Mercury being in progressed aspect to the Asc. increases the tendency of the chart to indicate cold weather. The indication is that under the influence of Sun and Jupiter in the fourth there would be some nice warm weather, but that much more of the weather would be cold. Climatological Data reports that the temperature and sunshine were subnormal during October, and that the daily range of temperature was large. November is reported to have been unusually warm, with more than average sunshine. But December was marked by a severe cold spell that prevailed from the 8th to the 14th, being so severe as to damage the citrus crop. December was decidedly a cold month. As this chart has 25 Gemini 02 on the Ascendant, we must look to those days when the planets make aspect to this degree for the more marked temperature changes. And because the Moon is so close to the Ascendant of the chart, its aspects assume more than usual importance throughout the season. The Moon being so powerful in the chart, its aspects to the Ascendant gain unaccustomed power to indicate changes in temperature. 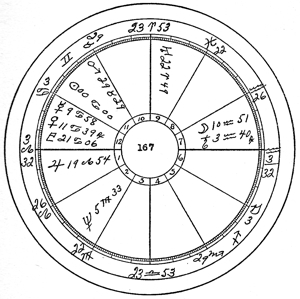 The first aspect, other than that of the Moon, was made immediately after the time for which the chart was erected. Mercury square Asc. was within the one effective degree of orb at the time the chart was erected, and brought a lowering of the temperature by two degrees on that day, Sept. 22. The next aspect was the sextile of Venus to the Asc. on Oct. 3, accompanied by a drop of one degree on that day, and a raise of one degree on Oct. 4. Then, on Oct. 11, Mercury came trine the Asc. with a rise of six degrees of temperature on the 11th, and a drop of seven degrees on Oct. 12. Oct. 18, the Sun came trine the Asc. with a rise of three degrees in temperature. Oct. 20, Mercury came semisquare the Asc., with a rise of six degrees on Oct. 20, and a drop of four degrees on Oct. 21. Sunday, Oct. 30, Mercury came to the inconjunct of the Asc., with a drop of four degrees of temperature recorded on Oct. 31. Nov. 2, the Sun came sesquisquare the Asc., with a rise in temperature of four degrees. Nov. 4, Mars came sextile the Asc., accompanied by a rise of one degree, followed by a drop the next day, and considerable increase a few days later. Nov. 17, the Sun came to the inconjunct aspect with the Asc., with a rise of five degrees of temperature on the 17th, and a rise of four degrees more on the 18th. The next aspect is Venus sesquisquare Asc. on Dec. 5, the day the Moon also made the square of the Asc. from Pisces. A drop of four degrees was registered for this day, and cold weather continued for a week, especially on those dates the Moon made aspects to the Asc. The cold spell was broken as the Sun approached the opposition to the Asc. from Sagittarius. The aspect was complete Dec. 16, with a rise of three degrees on the 15th, and a rise of one degree on the 16th, followed by a still further rise of four degrees on the 17th. Venus is also inconjunct the Asc. on the 16th, and thus helped break the severe cold spell. No other aspects, except those of the Moon, influenced the Ascendant during this season. The Sun entered Capricorn December 21, 1932, 5:21 P.M. LMT., Los Angeles. Chart No. 169, erected for this time. There are two planets in the fourth. Jupiter, being close to the cusp of the fourth, has the major influence, and it is warm. But the Moon in the same house is cool. Virgo, on the cusp of the fourth is cold, but Mercury, its ruler, is in the warm sign Sagittarius. This accounts for one-half of the influence of the chart. Pluto in the first is cool, and Cancer on the cusp of the first is cold. The Moon, ruler of the first, is in the cool sign Libra. This accounts for one-fourth of the influence of the chart. Saturn, ruling the sign occupied by the Sun, is in cold Aquarius. This accounts for one-eighth of the influence of the chart. Of the four planets in angles, Jupiter is warm, Pluto and the Moon are cool, and Uranus is cold. This accounts for one-eighth of the influence of the chart. We conclude, therefore, that under the influence of Jupiter, and Mercury in Sagittarius, there will be many sunshiny, fine days during the season, and that while Jupiter will prevent extremes of low temperature, that the season as a whole will be a cold one. Other than aspects of the Moon, the first aspect that occurred in the winter temperature chart was Venus inconjunct the Asc. on Dec. 26. There is no weather map for the 26th, but as might be expected from the moderating influence of Venus, Dec. 27 shows a rise of two degrees. The next aspect was Sun opposition Asc. on Dec. 28.This was from the cold sign Capricorn, and the temperature went down one degree, instead of up. So heavy an affliction of the Ascendant by the Sun, at this time of year, cannot be counted on to moderate the weather. Including All the Aspects Affecting Temperature. Thus far, because the heavier planets have a more enduring influence over the temperature, remaining within orb of the aspect they make to the Ascendant at least for more than one day, and perhaps for weeks or longer, I have neglected the influence of the Moon. Except by parallel, no aspect of the Moon to the Ascendant remains within the one effective degree of orb longer than about four hours. In natal astrology and stellar diagnosis, we call the progressed aspects made by major progressed Moon Submajor Aspects, because they are more powerful than minor progressed aspects, but weaker in their power to bring events into the life than the major progressed aspects of the other planets. 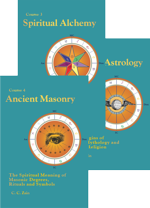 Not only in natal astrology and stellar diagnosis, but also in mundane astrology, horary astrology and weather predicting we have found through extensive observation that the influence of progressed Moon, other things being equal, is one-seventh of that of other progressed planets. Even though the influence of the aspects of the Moon to the Asc. is so temporary, nevertheless, for a complete study, on which to base predictions as to temperature changes, we must consider the normal temperature for the place at the particular season, the influence of the seasonal Temperature Chart as tending to cause a departure from this normal; and every aspect that forms to the degree on the Ascendant as having an influence, and marking the time of this influence, the aspects of the Moon included. Consequently, that I may illustrate the minor details, as well as the heavier influences, let us use Chart No. 169, which has 6 Cancer 54 on the Asc., giving the Ascendant 23 S 16 declination, and commencing Jan. 1,1933, consider all the aspects in their detailed influence, just as we would were we to undertake to make a day to day weather forecast. As there was no weather report on Jan. 1st or Jan. 2nd, the first aspect to consider is Moon square Asc. from the hot sign Aries on Jan. 3rd, with a rise of temperature of two degrees between the 3rd and 4th. Jan. 5, Mercury was parallel Asc., but the Moon was sextile Asc. from its exaltation in Taurus, with a rise in temperature of eight degrees. Jan. 7, the Moon was semisquare the Asc. from Taurus, with a rise of five degrees. Jan. 8, the Moon was parallel and semisextile the Asc., but there was no weather chart for that day. Jan. 10, the Moon was conjunction the Asc., and as would have been expected, the temperature dropped; it dropped nine degrees. Jan. 13, the Moon was parallel and semisextile the Asc. from the hot sign Leo, and the temperature went up two degrees, even though Mercury came to the opposition of the Asc. Jan. 14, the Moon was semisquare the Asc. from the hot sign Leo, and the temperature went up another three degrees. Jan. 15, the Moon went into the cold sign Virgo and made the sextile to the Asc. As this was Sunday there was no record, but on Jan. 16 the temperature went down seven degrees. Jan. 17, the Moon came square the Asc. from the cool sign Libra, lowering the temperature two degrees. Jan. 19, Venus came to the opposition of the Asc., with its customary moderating influence, at the same time the Moon came trine the Asc. from Scorpio. Scorpio tends to extremes, never to moderation; often giving hot, sultry weather. On this day the temperature went up seven degrees. Jan. 20, the Moon came sesquisquare the Asc. from the extreme sign Scorpio, and back went the temperature, falling off seven degrees. Jan. 21, the Moon made the weak aspect, inconjunct Asc. from the warm sign Sagittarius, and the parallel aspect to the Asc., and the temperature went up one degree. Jan. 24, Saturn made the semisextile to the Asc. and the Moon made the opposition to the Asc. from the cold sign Capricorn, and the temperature fell off four degrees. 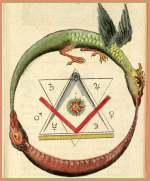 Jan. 26, the Sun and Moon both made the inconjunct aspect to the Asc., and the temperature went up nearly one degree. The Sun is warm, and the less powerful Moon is cool, but the aspect was from cold Aquarius. Jan. 27, the Moon came sesquisquare the Asc., with a further rise of four degrees. 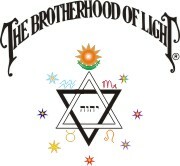 Jan. 28, the Moon went into cool Pisces and made the trine to the Asc., with a lowering of six degrees in temperature. Jan. 30, the Moon went into the hot sign Aries, making the square to the Asc., and the temperature went up three degrees. Jan. 31, Mercury came inconjunct the Asc., and as should have been expected, the temperature dropped two degrees. Feb. 1, the Moon made the sextile to the Asc., a moderate aspect, from the moderate sign Taurus, and the temperature went up one degree. Weak influences indicate weak changes in temperature. Feb. 3, the Moon was again parallel the Asc., and also made the semisquare to the Asc. from Taurus, and the temperature went up another three degrees. Government curtailment of the budget (this was a financial depression year) for Weather Maps caused these maps to be missing from my files from Feb. 3 to Feb. 17, 1933. So we will omit the aspects for which we have no coincidental records. Feb. 17, Mercury was trine the Asc. from Pisces, and the temperature went down three degrees. Feb. 18, the Moon in Sagittarius made the inconjunct to the Asc., with a rise of five degrees between the 18th and 19th. Feb. 20, the Moon made the opposition to the Asc., but no weather record was issued between the 18th and 21st the reading being higher on the 21st than on the 18th. Feb. 22, the Moon was parallel and inconjunct the Asc. from the cold sign Aquarius, and on Feb. 23 it was sesquisquare the Asc., and the temperature fell off nine degrees during those two days. Feb. 24, Venus was sesquisquare the Asc., and the Moon was trine the Asc., and on the 25th the Sun was trine the Asc. These aspects coincided with a rise of eight degrees in temperature. Feb. 26, the Moon was square the Asc. from hot Aries. As this was Sunday there was no record, but the temperature is shown rising on Feb. 25. March 1, 1933, the Moon was sextile the Asc. from Taurus and there was a drop of two degrees. March 2, the Moon was parallel the Asc. and semisquare the Asc., and the temperature fell off another two degrees. March 3, the Moon was semisextile the Asc. from usually cold Gemini, yet the temperature went up one degree. March 6, the Moon was conjunction the Asc., with a falling off of temperature two degrees between the 6th and the 7th. March 8, the Moon was semisextile the Asc. from the hot sign Leo, but it was also parallel the Asc., and instead of going up, the temperature went down two degrees. March 9, Mercury came within the one effective degree of orb of square the Asc., and the temperature, as usual under the influence of Mercury, fell off. It lowered five degrees. It remained within the one effective degree of orb for nine days, moving to 7 Aries 27 on March 13, then turning retrograde, and moving out of orb of square Asc. on March 18. March 10, the Moon was semisquare the Asc. from hot Leo, and in spite of Mercury�s influence the temperature went up two degrees. March 11, the Moon came sextile the Asc. from cold Virgo, indicating a downward fluctuation of temperature, but no records are available until March 13. March 12, Mars made the sextile of the Asc., but as the aspect came from cold Virgo, this forced the temperature up only one degree on the 13th, as the 12th being Sunday there was no record. March 13, in addition to Mars yet being sextile Asc. from cold Virgo, the Moon made the square of the Asc. from cool Libra. But as the square of Mercury was yet operative, as well as the cooling influence of the Moon, Mars was able to raise the temperature only one degree. March 15, the Moon came to the trine to the Asc. from Scorpio and the temperature went up two degrees. March 16, the Moon made the parallel with the Asc., but this coincided with almost no change in temperature..
March 17, the Moon made the inconjunct aspect with the Asc. from the hot sign Aries, but this seems to have been neutralized by Mercury still within the one effective degree of orb to the square of the Asc., and almost no temperature change took place. March 19, the Moon made the opposition to the Asc. from the cold sign Capricorn. There was no record, for this was Sunday, but Mercury had now moved beyond the one degree of orb to square of Asc., and on Monday, March 20, the record shows the temperature two degrees warmer. However, in considering this slight increase of temperature we must also make due allowance for the new temperature chart, which started the spring season at Los Angeles in 1933, on March 20, at 5:50 P.M. LMT. The new chart, coming in on the 20th, had Sagittarius on the cusp of the fourth, and this, together with its other indications would have some influence on the temperature for March 20. Above I have indicated by Weather Bureau records the influence of the aspects of the various planets to the Ascendants of the Temperature Charts, giving each temperature change in connection with the aspects of each planet other than the Moon for a period of some 15 months, and including the aspects made by the Moon to the Asc. for about three months. It is good practice to study the temperature charts here given, and the influence of the aspects made to the Ascendant coincident with temperature changes, with an ephemeris at hand to check the aspects mentioned. While this is good practice, and affords a preliminary foundation for further work, nothing can enable you to become efficient in predicting temperature changes, wind, and moisture precipitation in your own locality except through acquiring Weather Bureau records covering each season in your own area and becoming familiar with the normal weather to be expected, then erecting the weather charts for your vicinity and checking the temperature, air movements and precipitation from day to day, against these charts and the aspects made to the Ascendant of each as shown by the positions of the planets in the ephemeris. Such personal observations, if persisted in, will enable any intelligent person to do what most people consider marvelous things in weather predicting. Such checking of the weather is now facilitated by the radio. The radio stations commonly not only give a forecast of the weather for 24 hours ahead or more, as issued by the Weather Bureau, but usually they report on the maximum and minimum temperature that was actually present during each day. And most newspapers have a paragraph or two indicating what the weather has been each day. 7:30 A.M. LMT; 118:15W. 34N. Libra on cusp of fourth is cool, and Cancer, occupied by Venus, its ruler, is cold. Venus is conjunction cold Mercury. Jupiter in first and Leo on Asc. indicate warm, clear weather. Sun, ruling cusp of Asc., is in cool Cancer. Moon, ruling sign occupied by Sun, is in cold Aquarius. Jupiter in one angle is warm, but Saturn and Moon in another angle are cold and cool, respectively. 10:23 P.M. LMT; 118:15W. 34N. Sun and Jupiter in fourth are warm, but Mercury and Neptune there are cool. Virgo on cusp of fourth is cold, and the sign occupied by Mercury, its ruler, is cold Virgo. Moon in first is cool, Gemini on Asc. is cold, and its ruler, Mercury, is in cold Virgo. Venus, ruling sign Sun is in hot Leo. Three planets in angles—Moon, Mercury and Neptune— are cool, while two—Sun and Jupiter—are warm. 5:21 P.M. LMT; 118:15W. 34N. Jupiter in fourth is warm, but Moon in fourth is cool. Virgo on cusp of fourth is cold, but Mercury, its ruler, is in warm Sagittarius. Pluto in first is cool, and Cancer on Asc. is cold. Moon, ruler of Asc., is in cool Libra, opposition cold Uranus. Saturn, ruling sign Sun is in, is in cold Aquarius. Three planets in angles—Uranus, Pluto and Moon—are cold; but one planet in an angle—Jupiter—is warm.